Barrel comes with 1 bag of 50 rounds of our 3/4 load 45acp blanks. After 4 years of design and testing we now have the best 1911 blank barrel on the market allowing blanks to be fired consistently and reliably. 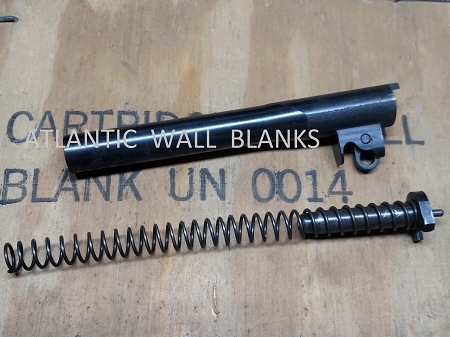 Kit includes blank fire barrel with a barrel link, dual action spring guide assembly, upgraded extractor* mainspring, and 4 restrictor screws. This is a drop in system with both set screw tuning and spring piston adjustment and will not require modifications to the ejection port of your gun. *Extractor will work with live ammunition as well as blanks and can be left in the pistol when it is returned to live fire. Due to the minor differences of different makes/models of guns, some minor fitting may be required. Comes with set screws for our 3/4, and Full Load 45acp pistol blanks. Screws for or 1/4 and 1/2 Loads also available on a limited basis. Barrel is designed around reliability with our blank profile and our loads. Firing live ammunition through blank barrels will result in serious injury or death. Designed in conjunction with Howell Arms. Produced exclusively for us by Howell Arms.